Part how-to-garden primer, The Arrows Cookbook combines more than 150 delicious recipes with time-tested techniques for growing herbs, vegetables, and edible flowers in a book that reconnects us to the land and the seasons. Cooking food from the backyard garden or farmers' market -- or even using herbs grown in pots in a sunny window -- goes beyond a passion for freshness. On an elemental level, the process reawakens the cook to a cycle of nature that our ancestors understood intuitively but that, for most of us, has been lost in the modern world. When chefs Clark Frasier and Mark Gaier left northern California to open their dream restaurant in southern Maine, they had no intention of becoming culinary pioneers. But in 1988 in Ogunquit, Maine, finding enough fresh vegetables and herbs to power a sophisticated restaurant was indeed a challenge. So, like all can-do Americans, they did something. A ragged field of witchgrass behind the restaurant was turned into a garden where they learned to coax a nine-month growing season out of the chilly earth. They built raised beds, saved seeds, researched heirlooms, consulted experts, and started seedlings. Today, that acre of Maine yields 270 varieties of vegetables, herbs, fruits, and edible flowers that provide 90 percent of the produce served at Arrows. Born of great necessity, the garden is the soul of this destination restaurant. 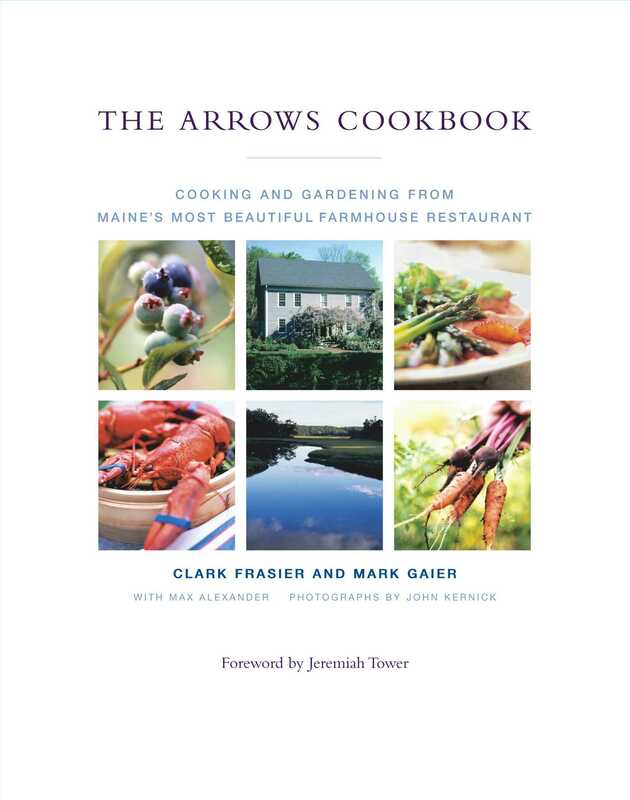 In The Arrows Cookbook, Frasier and Gaier tell us how they do it, charting the timeless journey from seed to supper. Recipes celebrate each season -- Asparagus with Mizuna and Blood Orange Vinaigrette and English Pea Soup in spring; Grilled Antipasto Platter and Rib-Eye Steak with Herbs and Caramelized Onions on a summer evening; Napa Cabbage and Apple Cole Slaw and Roast Pork Loin with Rosemary and Garlic for fall; and Escarole and White Bean Soup and Winter Greens with Pink Grapefruit and Red Onion for the chilly, short days of winter. They also offer new takes on such New England classics as Boiled Dinner, Our Way to Steaming Lobster -- Southeast Asian Style, as well as a glorious Thanksgiving feast complete with Roast Turkey with Gravy. The book is full of clear advice and instructions that will make you elegantly self-sufficient in both kitchen and garden: how to smoke a trout, preserve herbs, use raised beds to extend the growing season, make your own prosciutto, start seeds indoors, roast salmon on a plank, maximize garden space, freeze berries, select edible flowers, grow heirloom tomatoes, pickle hot peppers, find local farmers and fisherman for fresh meats and seafood, and more. All cooking is a process. Measure, mix, bake for an hour. Yet it is obvious that the process of preparing a meal begins long before the oven is heated. Name an ingredient, from anglerfish to zucchini, and it probably begins with a seed. The evolution of food from seed to supper has been the chief preoccupation of man throughout history. The life of a restaurant is also a process. When Arrows opened in 1988, we had in mind a casual brasserie, not the elegant country destination it grew to become. And it was several years before we began growing our own food from seed. Our journey to a two-hundred-year-old farm in northern New England began a continent (and several climate zones) away. After many years working for the talented San Francisco chef Jeremiah Tower of Stars, we decided to open our own restaurant. We had watched the gourmet craze that swept America during the 1980s from both sides of the kitchen door, and we had mixed feelings about America's new obsession with fine cooking. On one hand, any trend that pulled Americans away from the frozen-food aisle and back into the fresh produce section of the grocery store was a good thing. On the other hand, the new cuisine seemed driven more by status than sustenance. While striving for trendy cuisine based on the latest exotic flavor, Americans forgot their own good cooking. But we remembered. Mark grew up in Ohio where his mother cooked every meal with fresh ingredients from the surrounding Amish countryside. On special occasions her dinners could rise to the level of elegance, but mostly she made solid, heartland suppers like Mark's favorite, pork roast. As a child Mark always looked forward to strawberry season, when he and his brothers and sisters would pick berries at a nearby farm all day, stop at the dairy for vanilla ice cream, and then go home -- to wait impatiently as Mom baked pie. Clark also grew up picking summer berries, near Loon Lake in Washington State, where he spent glorious vacations with his grandparents. There he would rise early to go trout fishing, cooking his catch over a sizzling charcoal grill at the end of the day. Such memories, tied tightly to family and home, constitute a culinary tradition in any society. Of course, we did not intend to relive our boyhood memories in a restaurant. Nor could we deny our passion for cooking traditions from other cultures, especially the flavors that Clark grew to love during a year studying Chinese at the Beijing Language Institute. Asian cooks strive for balance and contrast -- the philosophical notion of yin and yang as applied to cuisine, if you will. Sweet is contrasted with sour, hot with cool, crunchy with smooth, fried with steamed. Asian cooks pay great attention to individual ingredients, yet the combination transcends the specific. It's easy to see the difference between Asian and Western cooking, but what struck Clark were the similarities. Watching Chinese peasants cure cabbages for the winter, he thought of sauerkraut, the Central European mainstay that evolved from the need (before refrigeration) to preserve summer's bounty. Curing pork into hams is a fall ritual in rural China, as it is on many farms in Maine. (Pigs are expensive to feed and shelter through the winter, so fall is the traditional time of slaughter around the world.) We wanted a restaurant that celebrated these universal culinary traditions, which are rooted in the march of the seasons. Whether those seasons gallop or crawl depends on where you live, of course. In California, where the growing season stretches from February to November, we naturally turned to our abundant local crops for inspiration; Poached Garlic Soup with Thyme and Red Pepper Creams (page 214) was an early hit. Using fresh greens and herbs to lighten sauces became one of our trademarks. Here we were building on Southeast Asian cuisine, in which fresh herbs brighten the taste of hearty noodle soups like the Vietnamese national dish, pho. Our plan was to open a restaurant where we lived in the California coastal town of Carmel. But jaw-dropping real-estate prices there turned our passion for food into a discouraging scramble for cash. We wanted to greet customers, not huddle with lawyers and bankers. Off we flew to have a look, arriving in Maine during one of the harshest winters in memory. The restaurant, in a colonial-era farmhouse, was named Arrows -- a whimsical reference to the home's authentic "Indian shutters," which were meant to protect settlers against attack. It was closed for the season; snow had drifted halfway up the first-floor windows, and the heat was shut down. Looking back that was probably a good thing. Had it not been so bone-chilling cold, we might have lingered long enough to notice all the work needed. Instead we saw a home -- and an old one at that. Built in 1765, it was constructed out of materials from the surrounding woods, like all houses of that time. The framework was made of massive spruce trees, cut with hand saws, then dragged, or "twitched," out of the forest by teams of oxen. Carpenters shaped the logs into square beams using a hand tool called a broadax. Highly skilled craftsmen called joiners cut the ends of the beams into mortises and tenons, perfectly matched joints that locked together the framework. (Metal fasteners, which had to be hand-wrought at great expense, were reserved for hinges and other essential moving parts.) This carpentry was so exacting that every joint was labeled and matched; today you can often see those Roman numerals or letters chiseled into the beams of New England farmhouses. The house was speaking to us, and not just figuratively. Every time the biting northeast wind whistled through the gables, the old place creaked and moaned. We signed a lease with an option to buy, flew home to California, and packed our bags. The phrase "What have we done?" could have been invented for that car trip east across the United States. The luxurious world of Bay Area restaurants quickly receded behind the interstate monotony of motels and McDonald's, and we arrived in Ogunquit on a cold, dreary day in March. Clark's parents, who lived in California, had come along on the drive to help us move and open the restaurant. In Maine we were joined by Mark's brother and his wife, who lived in Hampden, Maine, three hours north of Ogunquit. From dawn to dusk we cleaned ovens, painted walls, and scoured floors. Clark's mother made grocery runs, and every night we collapsed, starving, around a table in the chilly bar to devour rib-sticking meals like black bean soup and cornbread, washed down with samples from the wine salesmen. The pressure was enormous, but so was the sense of accomplishment and the love of our families working together. The gods of the hearth must have been smiling on us because we made our opening date just as our credit cards were maxing out. didn't handle the fish properly. Now, thanks to conscientious purveyors, we get our pick of the freshest local mussels, striped bass, oysters, and tuna -- not to mention loup de mer from France and crayfish from New Zealand that are still kicking when we open the case. We weren't alone, of course, and as more Mainers began to demand better food, the local growers and fishermen responded. But in the meantime, the only way we could get good bread was to bake our own. And it didn't take long to realize that if we wanted produce like that in San Francisco, we'd have to grow our own. Thus was the garden born of necessity, from a ragged field of witch grass at a time when iceberg was about the only lettuce we could order. Now, thanks to the tireless work of a succession of dedicated gardeners, our growing beds stretch over almost an acre of land, providing the restaurant with 270 varieties of vegetables, herbs, and edible flowers. It has, in fact, become the first destination for diners, who arrive early to stroll the grounds. Quite unintentionally, the garden conceived to fill the restaurant's needs is now a primary attraction. We wish more American chefs would grow their own food. The main obstacle is that in America innovative cuisine chiefly emanates from big cities where gardens aren't practical. Yet in many countries the best chefs work close to the countryside -- where the food is. Some of the greatest restaurants in France and Italy are off the beaten path, where the chefs tend primeval plots of asparagus and gooseberries. Those chefs know what we have learned: Food from your own garden not only tastes better but also makes you a better cook. It's common knowledge that fresh-picked vegetables have more taste and a crisper texture than anything trucked into a grocery store; how else to explain the renaissance of local greenmarkets in towns and cities across America? But cooking homegrown food goes beyond a passion for freshness. On an even more elemental level, the process connects the cook to a cycle of nature that our ancestors understood intuitively but that, for most of us, has been lost in the modern world. Participating in that cycle -- which begins with a seed, progresses to the dinner table, and concludes in the compost bin, where it begins again -- is more satisfying than the pleasures of any single meal. When you cook homegrown food, you're not the "end user" of the food chain, you're in the middle of it. This connection to nature is not just an intellectual conceit. The French have a word, terroir, that literally means soil but connotes something deeper and more personal -- the unique soil of one's own land. They understand that on some cosmic level, man is rewarded in health and happiness when he consumes the vital goodness of his own land. It's why that carafe of rough local wine in a little French country auberge tastes so exquisitely perfect -- and why it doesn't taste the same in Paris or Pennsylvania. If all that sounds vaguely spiritual, so be it. Gardens are heavenly places, and the world could use more of them. You don't have to believe in the cosmic wisdom of cooking from the garden; it's enough to realize that your garden will make you smarter about food. When you stroll the produce section of the supermarket, what you notice about peppers, eggplants, and tomatoes are their differences. But in the garden you notice instead how similar they are. (All three are fruits because we eat the seed pod, but they are also all members of the Solanaceae family.) You notice their stalks, thick and woody but often in need of staking as the fruit ripens and swells; their long, drooping leaves; their five-pointed flowers with five separate stamen. You might also notice they attract the same insects. (Yes, even those pesky bugs can teach us.) By understanding this kinship in the garden, one begins to see how these vegetables can work together in the kitchen. That's how we came up with Polenta Lasagna (page 235), which marries these vegetables in a new way, but in a way that makes sense according to nature. Cooking from the garden has kept our culinary experiments firmly rooted (no pun intended) in a larger reality, and it will do the same for you. We hadn't planned on being pioneers in a culinary wilderness, much less garden-club tour guides. Yet the harder we worked at creating our own food supply, the deeper kinship we felt with the colonial homesteaders who had built our farmhouse and cleared the land. As is so often the case, what began as a problem turned into a blessing. Self-sufficiency became our link to the past and began to inform every aspect of Arrows. While we had always made abundant use of fresh herbs in our cooking, once we started gardening, herbs took center stage -- in part because they were there. The truth is you're not going to run to the supermarket for a sprig of rosemary. But when you have rosemary -- and mint, chervil, oregano, parsley, thyme, cilantro, basil, and sage -- growing outside your kitchen door, you will find ways to use them every day. Consider our love affair with root vegetables. In sunny California we almost never roasted turnips, beets, parsnips, and such; it's just not something you think of eating under a palm tree. But in Maine we came to realize why New Englanders cherish these hearty vegetables on cold nights, for the long, slow baking process fills the house with warmth and aroma. Now we plant whole sections of our garden in root vegetables. For the first seven years, we lived above the restaurant and put all of our money into renovations. Like many people who buy an old country home, our life became a replay of that classic Cary Grant-Myrna Loy film, Mr. Blandings Builds His Dream House. There is a law of old farmhouses that says that as soon as you solve one major problem -- say, the need for a new septic system -- something else goes, like the well. One year brought new wiring, which allowed us to properly light the dining room. In another year we commissioned a local craftsman to make 125 black walnut and cherry chairs. In 1995 we bit the bullet and ripped out the claustrophobic kitchen, trashing the old equipment and building a brand-new space with high ceilings and dramatic casement windows overlooking the restaurant's entranceway. Clark's dad, an accomplished woodworker, made the beautiful hutch and wine stands in the dining room. Countless other refinements and improvements came every year. Our wine list had been growing steadily to the point where our dirt-floor basement cellar was overflowing. When the Boston Globe's wine critic, Robert Levy, gave us a great review in 1989, we knew it was time for a real cellar. A vacant space above the restaurant became a state-of-the-art temperature-controlled wine room. Such was the process that took Arrows from simple bistro to dining destination. Our greatest satisfaction has been the loyalty of our customers, many of whom have been coming every week for fifteen years. Some are year-round locals, including folks from nearby Portland, a thriving small city with a vibrant waterfront district. Others are "summer people" who spend most of the year in cities far from Ogunquit. Still others make the hour-and-fifteen-minute drive north from Boston just to dine at Arrows. They all come for the food, the garden, and the friendship. And they have far more choices in Maine today. In recent years the Maine dining scene has exploded, and we are gratified to see many other talented chefs opening restaurants in the Pine Tree State. Gourmet One of America's Best 50 Restaurants. Horticulture Arrows is part of a burgeoning trend...that celebrates regionality and seeks to strengthen the essential link between garden and table. Wine Spectator Set in an 18th-century farmhouse, Arrows embodies the Yankee spirit of self-sufficiency...and Arrows never misses the bull's-eye. Bon Appétit One of the country's ten most romantic restaurants. Travel + Leisure The setting at Arrows would be enough...but the new American food will take you even higher. Victoria At Arrows, both the harvest and the cooking transcend local limits. Town & Country Elegant and refreshingly subtle, Arrows does not assault the senses. It coaxes them gently, casting a spell. Family Circle Easy Gardening At a lovely Maine farmhouse turned restaurant, parterres of fresh produce share the limelight with fabulous food.